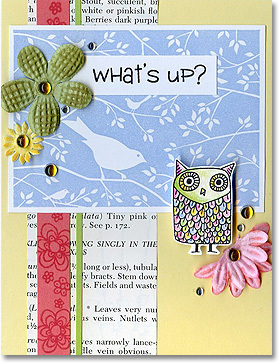 Send a fun “what’s up” with this cheerful card! Stamp Bird on a Branch with baby blue ink on white cardstock and trim, leaving a border. Stamp flower border from the Clear Design Happy Hello set with red ink on a Strawberry strip. Stamp “what’s up?” from the Clear Design Happy Hello set with black ink on a white strip. Trim a Green Apple strip and a text strip, then assemble card as shown. Stamp owl with black ink on white, color with pencils and cut out. Add to card with foam tape. Rub chalk inks in coordinating colors on Art Flowers to distress them. Add smooth yellow gems, smooth clear gems and Art Flowers to card. Mix and match bold and outline stamps for a playful look.